Thursday September 14th 1899 Will went to West Liberty with Simpsons. I washed windows fixed my plants, put down eggs and got the dinner. I went up home in the afternoon for a little while, and got some things in town. 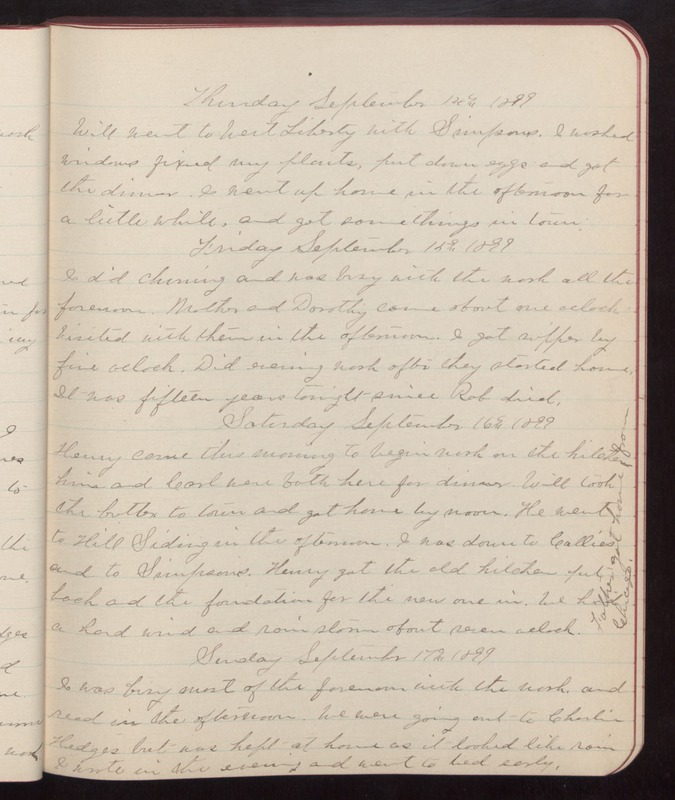 Friday September 15th 1899 I did churning and was busy with the work all the forenoon. Mother and Dorothy came about one oclock Visited with them in the afternoon. I got supper by five oclock. did evening work after they started home. It was fifteen years tonight since Rob died. Saturday September 16th 1899 Henry came this morning to begin work on the kitchen him and Carl were both here for dinner. Will took the butter to town and got home by noon. He went to hill Siding in the afternoon. I was down to Callies and to Simpsons. Henry got the old kitchen put back and the foundation for the new one in. We had a hard wind and rain storm about seven oclock. Father got home from Chicago Sunday September 17th 1899 I was busy most of the forenoon with the work, and read in the afternoon. We were going out to Charlie Hedges but was kept at home as it looked like rain I wrote in the evening and went to bed early.